When looking for an artificial tree for the holidays, green is not the only color to keep in mind. If you want a tree to match the season, considering a different color can open up a number of decorating possibilities. In this post, we feature Christmas Tree Market’s Sparkling White Tree and present a few reasons why it might be the tree for you. Featuring a profile that’s only 46 inches wide, the Sparkling White Tree comes with high-quality hinged PVC branches that make up its dense foliage. Its tip count is optimized to make tree shaping as easy as possible. It has a relatively high tip count for its size, giving it a look of fullness similar to that of a full-size tree. Designed for a winter holiday, its white branches and needles combine to create an all-white ensemble ideal for any holiday motif. Hinged branches make the Sparkling White Tree convenient and easy to set up. All you have to do is put the sections together and the branches will naturally fall into place. With some fluffing, you’ll have a radiant snowy white tree ready for Christmas and all through winter. It’s also pre-lit with professionally strung clear lights that are spread evenly throughout the tree’s foliage, giving it a radiant glow. You don’t have to worry about hanging lights on your tree; all you have to do is plug it in. The Sparkling White Tree is a great option for smaller living spaces. With its narrow profile, it still manages to retain a full look, making it an ideal canvas for your ornaments and decorations. Because you can use it in almost any room around the home, it’s easier to spread the holiday cheer and keep the spirit of the season alive. The Sparkling White Tree is hand-picked by Christmas Tree Market as part of its “Best Value” Christmas trees. This means that this tree, among a few others, is a high-quality product that can be yours at a reasonably low price. 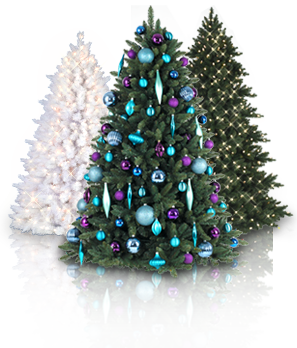 Known as one of the top-rated online stores of high-quality Christmas trees, Christmas Tree Market offers great value through the Sparkling White Tree with its compact size, convenient design, and topnotch craftsmanship. If you’re looking for a tree with a wintry charm or simply want one that can help put your decorations in the best light, the Sparkling White Tree is an exceptional choice due to its color and design. Use it in different areas of your home and watch as it brings the beauty of a winter wonderland into your home.